"since starting Sustain I'm now back in control and don't need my medication to help with the weight loss like they thought and am no longer borderline diabetic. Also not only am I having the weight and inch loss, I feel so much better! I'm sleeping better, have more energy, I don't have a constant cold, my hair is in better condition and my battle with spots for 20 years has cleared up." Ever since I had my 2nd child (3 years ago) my weight has been a battle. 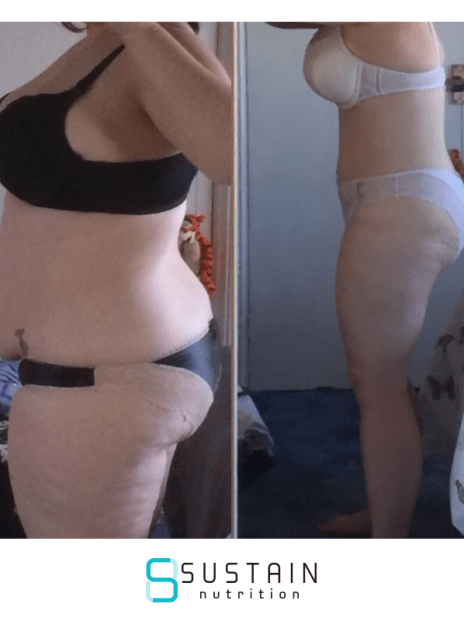 I had post natal depression so was put on medication and I put on approx 2.5 stone in as many months and continued to creep up for another 2 years. Also I have poly cystic ovaries so weight loss is harder but it’s a vicious cycle, if I don’t lose weight, my symptoms get worse etc. However, since starting Sustain I’m now back in control and don’t need my medication to help with the weight loss like they thought and am no longer borderline diabetic. Also not only am I having the weight and inch loss, I feel so much better! I’m sleeping better, have more energy, I don’t have a constant cold, my hair is in better condition and my battle with spots for 20 years has cleared up. Alongside this I’ve completed the Couch to 5k app when I started I couldn’t run 30 seconds let alone 30 minutes! I really am a different person. I’ve come a long way… still a way to go but this has been a lifestyle change for me and such a positive one.